Happy Spring everyone!!! I hope you are seeing some Spring blossoms popping up already. 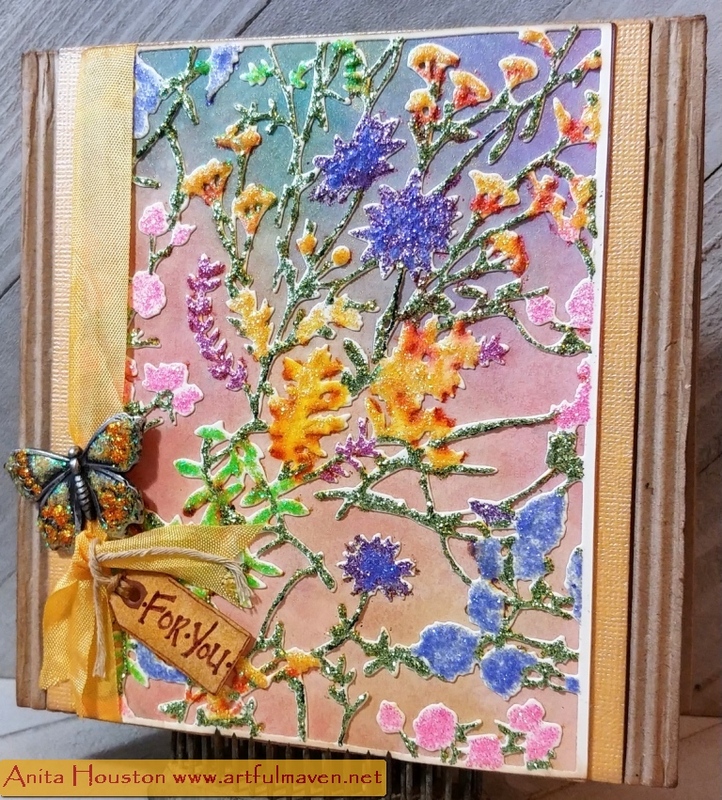 If not, then maybe this Spring like card keeps you until you do. 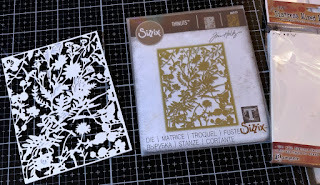 Yesterday, I showed you what you can do with Ranger Stickles in the negative spaces of a die cut card, and today I have Stickles on the positive parts, or borders, of Tim Holtz's Organic Thinlit from Sizzix. 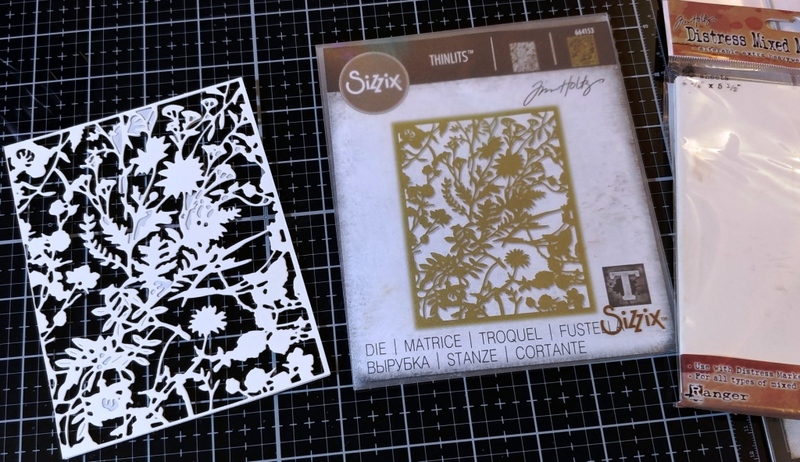 This card took a bit more time to make and more supplies, but I wanted to point out that you can use the same type of focal image die using Stickles in either the positive or the negative areas. I am loving these types of dies...makes it more simple. Since the positive of the die would be covered up with Stickles, I needed something for the background, so it was the new Distress Oxide Sprays from Tim and Ranger to take care of that. I misted the sprays on one at a time in different sections onto Distress Heavystock and then heat dried. 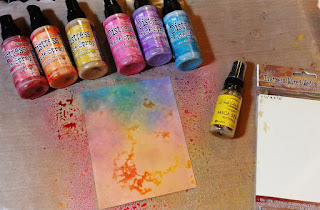 Then I added more on top and misted with water while drying. They are fabulous, because you get the properties of translucent Distress which is water reactive with the properties of a permanent opaque ink as well...it's the best of both worlds...and no mud..just layers of color. I totally love them! 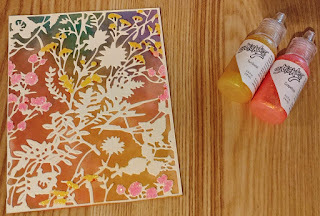 These colors created a soft background, perfect for this die, but for some added sunshine sheen, I misted a tiny bit of Wendy Vecchi's Mica Spray in Buttercup on top...perfect! I added Adhesive Sheet to the back of Heavystock, and die cut the Organic Thinlet, running it through about three times to make sure all parts were cut perfectly. Then I added it on top of the background piece. 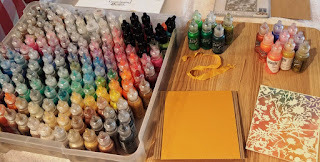 As you can see, I think I own every color of Stickles and Liquid Pearls, so it takes me a second to select my colors, LOL! I also prepared my card base, corrugated kraft and a gold piece of shimmer cardstock. 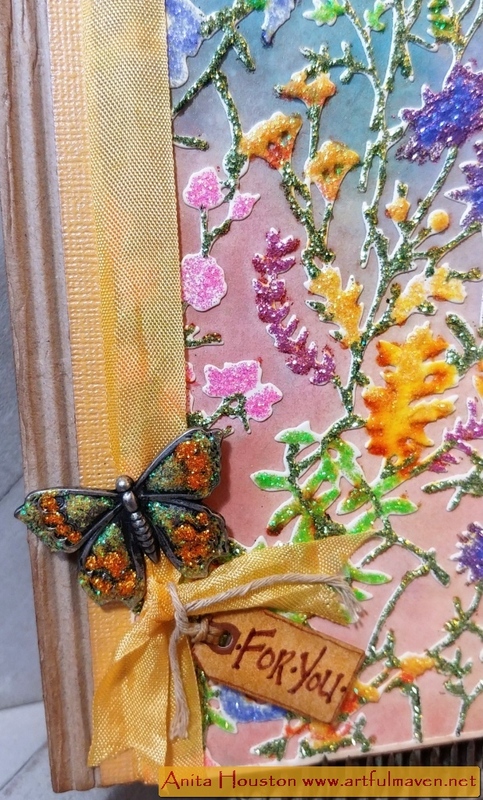 I had a piece of Tim's Crinkle Ribbon already colored with Fossilized Amber Distress Spray Stain as well. 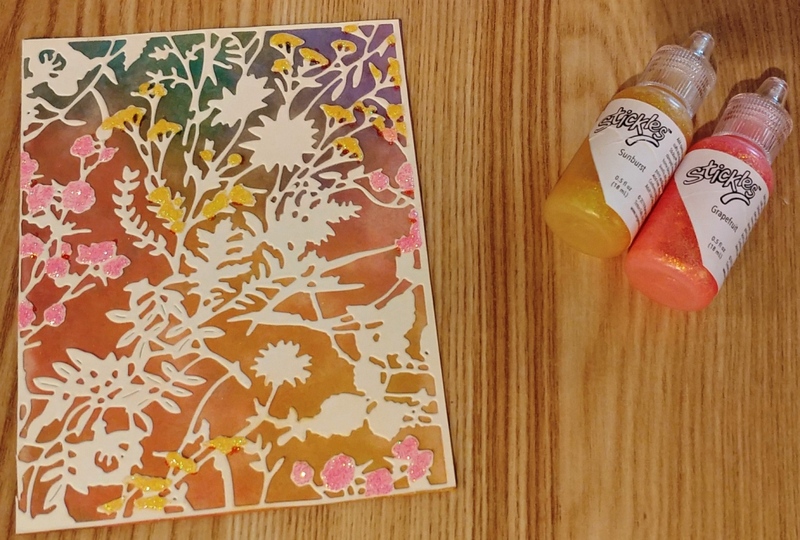 I used one color at a time to fill in the positive portions of the die, starting with two new colors of Stickles, Grapefruit and Sunburst. I used a toothpick to pick up any Stickles that spilled over into the negative areas...probably should have waited to adhere the die until after to avoid that. I did this at night so it had lots of time to dry. The next morning, I mounted this onto the gold cardstock, tied the ribbon, and mounted onto the corrugate base. I added a tiny tag that I handwrote the sentiment on, and then decided it needed more. 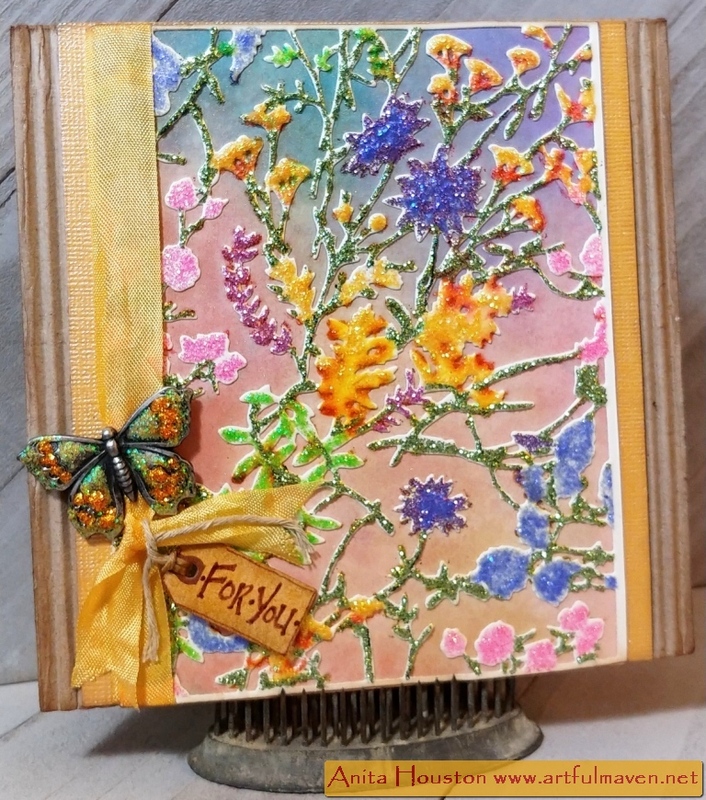 I added the Idea-ology Butterfly, and even added some Stickles on it. 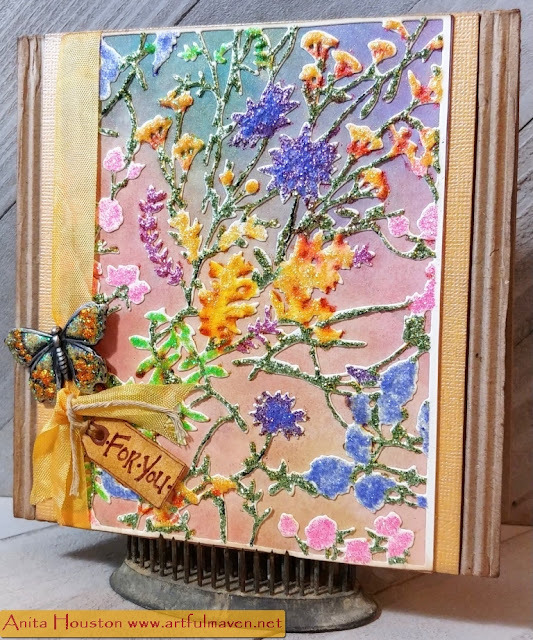 Easter projects are in full bloom here, so it won't be long until I'm back. Oh, my goodness, Anita! This is a labor of love, but oh, so worth that gorgeous shimmery sparkle! Love this, and wish I could pin it, but for some reason I'm unable to pin anything anymore...:(. 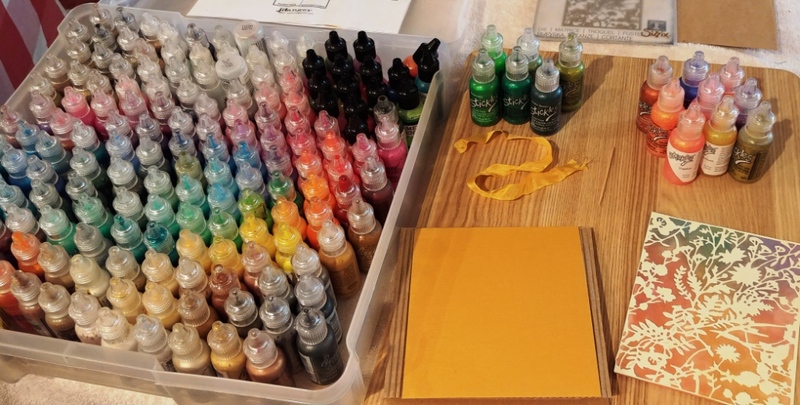 "She said 'that's a lot of money to spend on crafts (stickles/LP's), and I knew we could never be friends." Tim H., Snarky Hugs to you!